It's no secret that I'm fairly obsessed with Eucerin skin care products. They work so well to treat dry skin and leave it soft and hydrated hours after use. They're definitely my go-to skin care line, especially in the winter. My favorite new find is Eucerin's Aquaphor line. I'm not sure how I didn't know more about this magical tub before. 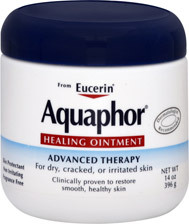 Aquaphor is a vaseline-like healing ointment that is used to treat dry skin and lips. It's gentle on the skin and frequently used on babies and recommended by dermatologists to remedy cracked skin, burns, minor cuts and skin irritations. The formula packs glycerin, chamomile essence, and provitamin B5 to moisturize effectively and a little drop goes a long way on your skin. Spring is hopefully around the corner and there's no doubt your skin will be transitioning from the dryness of the season by being extra flaky, uncooperative and dry, so good moisturizing products are essential. A few drops of this potent solution will instantly revive your dull skin and lips and help you welcome in the seasonal changes. If you don't already own a bottle, run out and grab one today! You won't be sorry! Aquaphor gets a big Beauty Buff seal of approval! Enjoy it and spread the word! I love the stuff. I was recommended for it from my Tattoo artist to use it on my tattoo. I also use it on my chap lips.